Algood, Tennessee, U.S.A. – July 6, 2015 – Research Electronics International (REI) has introduced a new Non-Linear Junction Detector (NLJD) – the ORION 2.4 HX. The new ORION 2.4 HX compliments the standard ORION 2.4, introduced in 2013, with several distinguishing features including a 3.3W model and a higher 6.6W transmit power model, both with built in touch screen display. An NLJD is used to detect and locate electronic devices, regardless whether they are switched on (active) or off (inactive). 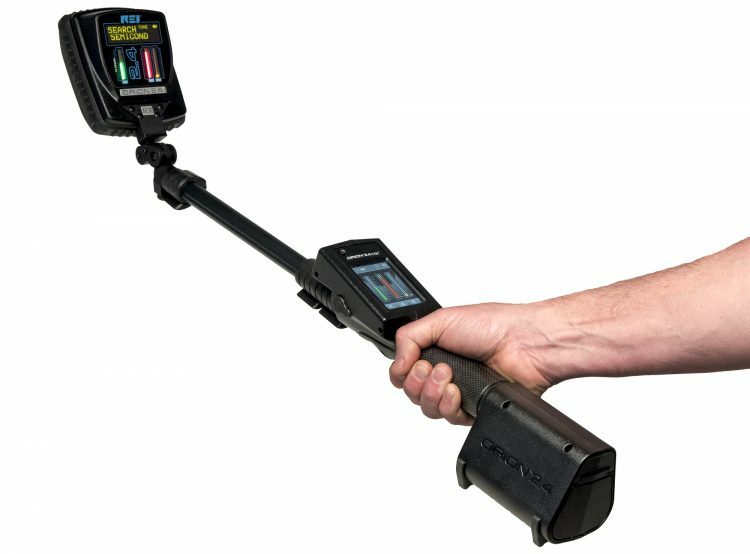 They can be used to look for hidden illicit electronic devices. The ORION 2.4 HX touch screen display is molded into the poly-carbonate body and displays graphical data, antenna responses, and operations controls of the ORION. Transmit power on the ORION 2.4 HX is 3.3W or *6.6W average EIRP (Effective Isotropic Radiated Power), depending on the model. The 1.25 MHz bandwidth of the ORION 2.4 HX increases sensitivity and puts more detection energy on an object at a given time. The 2.4 GHz digitally modulated spread spectrum signal provides increased detection range, and interference avoidance. When powered on, the ORION 2.4 HX synthesized transceiver automatically selects a quiet transmit frequency and can also be specified manually. High speed DSP (Digital Signal Processing) and a wideband digitally modulated transmit signal makes response time near instantaneous, while improving detection and minimizing interference. Software on the new display provides graphs for transmit power, frequency, and 2nd and 3rd harmonics. A Time Graph shows the continuous history of harmonic response and power adjustments in spans from 10 – 60 seconds. The antenna head has the same line of site bar graph display as the standard ORION 2.4, showing transmit power, 2nd, and 3rd harmonics. In addition to the visual response, the ORION 2.4 HX also provides selectable audio and haptic (vibration) responses when a potential device is encountered. An alert threshold can also be selected to only allow audible or haptic responses beyond defined levels. The compact antenna head allows easier access to small areas and is circularly polarized for signal reception regardless of the antenna’s orientation. The synthesized transceiver provides frequency stability and agility to automatically search for clean operating frequencies between 2.404 GHz-2.472 GHz. Receiver sensitivity to both 2nd and 3rd harmonics is -140 dBm. 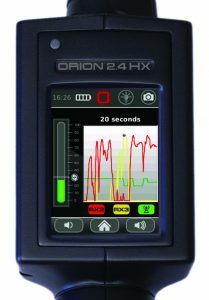 The higher power 2.4 GHz digital spread spectrum signal, the touch screen display and reporting data available with the HX model offer considerable enhancements to the new generation ORION 2.4. * NOTE: The ORION 2.4 HX 6.6W model is authorized for use only by entities, agencies, and persons not restricted by US FCC, CE, and IC. The ORION 2.4 HX 3.3W model is compliant with FCC and IC technical standards and has been CE marked.